New Alfa Romeo Stelvio for Sale Near Jacksonville, FLFor folks in Smyrna Beach, FL who want the convenience of a family SUV but long for the style, grace, and thrill of a European sports car, the new Alfa Romeo Stelvio is a perfect fit. Starting at $41,995 MSRP, this luxury sport SUV develops between 280 hp and 505 hp, yet it can also comfortably seat five passengers and hold up to 56.5 cubic feet with the rear seats down. Additionally, you’ll find premium luxury accoutrements like leather upholstery, a dual-panel sunroof, and a harman/kardon audio system. 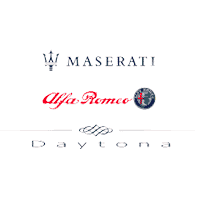 Contact the team at Maserati Alfa Romeo of Daytona to find out more!Test Drive the New Alfa Romeo Stelvio near Ormond Beach, FLThe team at Maserati Alfa Romeo of Daytona is ready to help you get into one of the sportiest family SUVs on the market today. Check out the new Alfa Romeo Stelvio today near Jacksonville, FL at our dealership, where you can get financing and secure top dollar for your trade-in vehicle right now! We’re located in Daytona Beach, FL, and you can reach us at (386) 523-1616. 2018 Alfa Romeo Stelvio White AWD 8-Speed Automatic I4THIS VEHICLE INCLUDES THE FOLLOWING FEATURES AND OPTIONS: 3.73 Axle Ratio, 4-Wheel Disc Brakes, 8 Speakers, ABS brakes, Air Conditioning, AM/FM radio, Auto-dimming Rear-View mirror, Automatic temperature control, Brake assist, Bumpers: body-color, Compass, Delay-off headlights, Driver door bin, Driver vanity mirror, Dual front impact airbags, Dual front side impact airbags, Electronic Stability Control, Four wheel independent suspension, Front anti-roll bar, Front Bucket Seats, Front Center Armrest, Front dual zone A/C, Front reading lights, Fully automatic headlights, Garage door transmitter, Heated door mirrors, High intensity discharge headlights: Bi-Xenon, Illuminated entry, Knee airbag, Leather Seats, Leather Shift Knob, Low tire pressure warning, Memory seat, Occupant sensing airbag, Outside temperature display, Overhead airbag, Overhead console, Panic alarm, Passenger door bin, Passenger vanity mirror, Power door mirrors, Power driver seat, Power Liftgate, Power passenger seat, Power steering, Power windows, Radio: AM/FM w/Bluetooth 6.5, Rain sensing wipers, Rear anti-roll bar, Rear audio controls, Rear fog lights, Rear Parking Sensors, Rear reading lights, Rear seat center armrest, Rear window defroster, Remote keyless entry, Roof rack: rails only, Security system, Speed control, Speed-sensing steering, Speed-Sensitive Wipers, Split folding rear seat, Spoiler, Steering wheel mounted audio controls, Tachometer, Telescoping steering wheel, Tilt steering wheel, Traction control, Trip computer, Turn signal indicator mirrors, Variably intermittent wipers, and Wheels: 18 x 8.0 5-Spoke Aluminum. 22/28 City/Highway MPGWe offer Market Based Pricing, please call to check on the availability of this vehicle. We'll buy your vehicle even if you don't buy ours. All vehicles are plus TT&L **HOME OF LIFETIME POWERTRAIN WARRANTY ON ALL NEW RAM'S! **EVERY PREOWNED VEHICLE HAS AT LEAST 7/32 OF TIRE TREAD AND AT LEAST 70% BRAKE LIFE REMAINING, OR WE WILL REPLACE IT. **12/12K MI WARRANTY ON ALL USED VEHICLES UNDER 75K MI. 2018 Alfa Romeo Stelvio Gray AWD 8-Speed Automatic I4THIS VEHICLE INCLUDES THE FOLLOWING FEATURES AND OPTIONS: 3.73 Axle Ratio, 4-Wheel Disc Brakes, 8 Speakers, ABS brakes, Air Conditioning, AM/FM radio, Auto-dimming Rear-View mirror, Automatic temperature control, Brake assist, Bumpers: body-color, Compass, Delay-off headlights, Driver door bin, Driver vanity mirror, Dual front impact airbags, Dual front side impact airbags, Electronic Stability Control, Four wheel independent suspension, Front anti-roll bar, Front Bucket Seats, Front Center Armrest, Front dual zone A/C, Front reading lights, Fully automatic headlights, Garage door transmitter, Heated door mirrors, High intensity discharge headlights: Bi-Xenon, Illuminated entry, Knee airbag, Leather Seats, Leather Shift Knob, Low tire pressure warning, Memory seat, Occupant sensing airbag, Outside temperature display, Overhead airbag, Overhead console, Panic alarm, Passenger door bin, Passenger vanity mirror, Power door mirrors, Power driver seat, Power Liftgate, Power passenger seat, Power steering, Power windows, Radio: AM/FM w/Bluetooth 6.5, Rain sensing wipers, Rear anti-roll bar, Rear audio controls, Rear fog lights, Rear Parking Sensors, Rear reading lights, Rear seat center armrest, Rear window defroster, Remote keyless entry, Roof rack: rails only, Security system, Speed control, Speed-sensing steering, Speed-Sensitive Wipers, Split folding rear seat, Spoiler, Steering wheel mounted audio controls, Tachometer, Telescoping steering wheel, Tilt steering wheel, Traction control, Trip computer, Turn signal indicator mirrors, Variably intermittent wipers, and Wheels: 18 x 8.0 5-Spoke Aluminum. 22/28 City/Highway MPGWe offer Market Based Pricing, please call to check on the availability of this vehicle. We'll buy your vehicle even if you don't buy ours. All vehicles are plus TT&L **HOME OF LIFETIME POWERTRAIN WARRANTY ON ALL NEW RAM'S! **EVERY PREOWNED VEHICLE HAS AT LEAST 7/32 OF TIRE TREAD AND AT LEAST 70% BRAKE LIFE REMAINING, OR WE WILL REPLACE IT. **12/12K MI WARRANTY ON ALL USED VEHICLES UNDER 75K MI. 2019 Alfa Romeo Stelvio Black RWD 8-Speed Automatic I4THIS VEHICLE INCLUDES THE FOLLOWING FEATURES AND OPTIONS: 3.73 Axle Ratio, 4-Wheel Disc Brakes, 8 Speakers, ABS brakes, Air Conditioning, AM/FM radio, Auto-dimming Rear-View mirror, Automatic temperature control, Brake assist, Bumpers: body-color, Compass, Delay-off headlights, Driver door bin, Driver vanity mirror, Dual front impact airbags, Dual front side impact airbags, Electronic Stability Control, Four wheel independent suspension, Front anti-roll bar, Front Bucket Seats, Front Center Armrest, Front dual zone A/C, Front reading lights, Fully automatic headlights, Garage door transmitter, Heated door mirrors, High intensity discharge headlights: Bi-Xenon, Illuminated entry, Knee airbag, Leather Seats, Leather Shift Knob, Low tire pressure warning, Memory seat, Occupant sensing airbag, Outside temperature display, Overhead airbag, Overhead console, Panic alarm, Passenger door bin, Passenger vanity mirror, Power door mirrors, Power driver seat, Power Liftgate, Power passenger seat, Power steering, Power windows, Radio: AM/FM w/Bluetooth 6.5, Rain sensing wipers, Rear anti-roll bar, Rear audio controls, Rear fog lights, Rear Parking Sensors, Rear reading lights, Rear seat center armrest, Rear window defroster, Remote keyless entry, Roof rack: rails only, Security system, Speed control, Speed-sensing steering, Speed-Sensitive Wipers, Split folding rear seat, Spoiler, Steering wheel mounted audio controls, Tachometer, Telescoping steering wheel, Tilt steering wheel, Traction control, Trip computer, Turn signal indicator mirrors, Variably intermittent wipers, and Wheels: 18 x 8.0 5-Spoke Aluminum. 22/29 City/Highway MPGWe offer Market Based Pricing, please call to check on the availability of this vehicle. We'll buy your vehicle even if you don't buy ours. All vehicles are plus TT&L **HOME OF LIFETIME POWERTRAIN WARRANTY ON ALL NEW RAM'S! **EVERY PREOWNED VEHICLE HAS AT LEAST 7/32 OF TIRE TREAD AND AT LEAST 70% BRAKE LIFE REMAINING, OR WE WILL REPLACE IT. **12/12K MI WARRANTY ON ALL USED VEHICLES UNDER 75K MI. 2018 Alfa Romeo Stelvio Black AWD 8-Speed Automatic I4THIS VEHICLE INCLUDES THE FOLLOWING FEATURES AND OPTIONS: 3.73 Axle Ratio, 4-Wheel Disc Brakes, 8 Speakers, ABS brakes, Air Conditioning, AM/FM radio, Auto-dimming Rear-View mirror, Automatic temperature control, Brake assist, Bumpers: body-color, Compass, Delay-off headlights, Driver door bin, Driver vanity mirror, Dual front impact airbags, Dual front side impact airbags, Electronic Stability Control, Four wheel independent suspension, Front anti-roll bar, Front Bucket Seats, Front Center Armrest, Front dual zone A/C, Front reading lights, Fully automatic headlights, Garage door transmitter, Heated door mirrors, High intensity discharge headlights: Bi-Xenon, Illuminated entry, Knee airbag, Leather Seats, Leather Shift Knob, Low tire pressure warning, Memory seat, Occupant sensing airbag, Outside temperature display, Overhead airbag, Overhead console, Panic alarm, Passenger door bin, Passenger vanity mirror, Power door mirrors, Power driver seat, Power Liftgate, Power passenger seat, Power steering, Power windows, Radio: AM/FM w/Bluetooth 6.5, Rain sensing wipers, Rear anti-roll bar, Rear audio controls, Rear fog lights, Rear Parking Sensors, Rear reading lights, Rear seat center armrest, Rear window defroster, Remote keyless entry, Roof rack: rails only, Security system, Speed control, Speed-sensing steering, Speed-Sensitive Wipers, Split folding rear seat, Spoiler, Steering wheel mounted audio controls, Tachometer, Telescoping steering wheel, Tilt steering wheel, Traction control, Trip computer, Turn signal indicator mirrors, Variably intermittent wipers, and Wheels: 18 x 8.0 5-Spoke Aluminum. 22/28 City/Highway MPGWe offer Market Based Pricing, please call to check on the availability of this vehicle. We'll buy your vehicle even if you don't buy ours. All vehicles are plus TT&L **HOME OF LIFETIME POWERTRAIN WARRANTY ON ALL NEW RAM'S! **EVERY PREOWNED VEHICLE HAS AT LEAST 7/32 OF TIRE TREAD AND AT LEAST 70% BRAKE LIFE REMAINING, OR WE WILL REPLACE IT. **12/12K MI WARRANTY ON ALL USED VEHICLES UNDER 75K MI. 2018 Alfa Romeo Stelvio Blue AWD 8-Speed Automatic I4THIS VEHICLE INCLUDES THE FOLLOWING FEATURES AND OPTIONS: 3.73 Axle Ratio, 4-Wheel Disc Brakes, 8 Speakers, ABS brakes, Air Conditioning, AM/FM radio, Auto-dimming Rear-View mirror, Automatic temperature control, Brake assist, Bumpers: body-color, Compass, Delay-off headlights, Driver door bin, Driver vanity mirror, Dual front impact airbags, Dual front side impact airbags, Electronic Stability Control, Four wheel independent suspension, Front anti-roll bar, Front Bucket Seats, Front Center Armrest, Front dual zone A/C, Front reading lights, Fully automatic headlights, Garage door transmitter, Heated door mirrors, High intensity discharge headlights: Bi-Xenon, Illuminated entry, Knee airbag, Leather Seats, Leather Shift Knob, Low tire pressure warning, Memory seat, Occupant sensing airbag, Outside temperature display, Overhead airbag, Overhead console, Panic alarm, Passenger door bin, Passenger vanity mirror, Power door mirrors, Power driver seat, Power Liftgate, Power passenger seat, Power steering, Power windows, Radio: AM/FM w/Bluetooth 6.5, Rain sensing wipers, Rear anti-roll bar, Rear audio controls, Rear fog lights, Rear Parking Sensors, Rear reading lights, Rear seat center armrest, Rear window defroster, Remote keyless entry, Roof rack: rails only, Security system, Speed control, Speed-sensing steering, Speed-Sensitive Wipers, Split folding rear seat, Spoiler, Steering wheel mounted audio controls, Tachometer, Telescoping steering wheel, Tilt steering wheel, Traction control, Trip computer, Turn signal indicator mirrors, Variably intermittent wipers, and Wheels: 18 x 8.0 5-Spoke Aluminum. 22/28 City/Highway MPGWe offer Market Based Pricing, please call to check on the availability of this vehicle. We'll buy your vehicle even if you don't buy ours. All vehicles are plus TT&L **HOME OF LIFETIME POWERTRAIN WARRANTY ON ALL NEW RAM'S! **EVERY PREOWNED VEHICLE HAS AT LEAST 7/32 OF TIRE TREAD AND AT LEAST 70% BRAKE LIFE REMAINING, OR WE WILL REPLACE IT. **12/12K MI WARRANTY ON ALL USED VEHICLES UNDER 75K MI. 2018 Alfa Romeo Stelvio White Ti AWD 8-Speed Automatic I4THIS VEHICLE INCLUDES THE FOLLOWING FEATURES AND OPTIONS: 3.73 Axle Ratio, 4-Wheel Disc Brakes, 8 Speakers, 8.8 Widescreen Color Display, ABS brakes, Air Conditioning, AM/FM radio: SiriusXM, Auto-dimming Rear-View mirror, Automatic temperature control, Brake assist, Bumpers: body-color, Compass, Delay-off headlights, Driver door bin, Driver vanity mirror, Dual front impact airbags, Dual front side impact airbags, Electronic Stability Control, Four wheel independent suspension, Front anti-roll bar, Front Bucket Seats, Front Center Armrest, Front dual zone A/C, Front reading lights, Fully automatic headlights, Garage door transmitter, Genuine wood console insert, Genuine wood dashboard insert, Genuine wood door panel insert, Heated door mirrors, Heated front seats, Heated steering wheel, High intensity discharge headlights: Bi-Xenon, Illuminated entry, Knee airbag, Leather Seats, Leather Shift Knob, Low tire pressure warning, Memory seat, Occupant sensing airbag, Outside temperature display, Overhead airbag, Overhead console, Panic alarm, Passenger door bin, Passenger vanity mirror, Power door mirrors, Power driver seat, Power Liftgate, Power passenger seat, Power steering, Power windows, Radio: AM/FM w/Bluetooth 8.8, Rain sensing wipers, Rear anti-roll bar, Rear audio controls, Rear fog lights, Rear reading lights, Rear seat center armrest, Rear window defroster, Remote keyless entry, Roof rack: rails only, Security system, Speed control, Speed-sensing steering, Speed-Sensitive Wipers, Split folding rear seat, Spoiler, Steering wheel mounted audio controls, Tachometer, Telescoping steering wheel, Tilt steering wheel, Traction control, Trip computer, Turn signal indicator mirrors, Variably intermittent wipers, and Wheels: 19 x 8.0 Y-Spoke Aluminum. 22/28 City/Highway MPGWe offer Market Based Pricing, please call to check on the availability of this vehicle. We'll buy your vehicle even if you don't buy ours. All vehicles are plus TT&L **HOME OF LIFETIME POWERTRAIN WARRANTY ON ALL NEW RAM'S! **EVERY PREOWNED VEHICLE HAS AT LEAST 7/32 OF TIRE TREAD AND AT LEAST 70% BRAKE LIFE REMAINING, OR WE WILL REPLACE IT. **12/12K MI WARRANTY ON ALL USED VEHICLES UNDER 75K MI. 2018 Alfa Romeo Stelvio Blue Metallic Ti AWD 8-Speed Automatic I4THIS VEHICLE INCLUDES THE FOLLOWING FEATURES AND OPTIONS: 3.73 Axle Ratio, 4-Wheel Disc Brakes, 8 Speakers, 8.8 Widescreen Color Display, ABS brakes, Air Conditioning, AM/FM radio: SiriusXM, Auto-dimming Rear-View mirror, Automatic temperature control, Brake assist, Bumpers: body-color, Compass, Delay-off headlights, Driver door bin, Driver vanity mirror, Dual front impact airbags, Dual front side impact airbags, Electronic Stability Control, Four wheel independent suspension, Front anti-roll bar, Front Bucket Seats, Front Center Armrest, Front dual zone A/C, Front reading lights, Fully automatic headlights, Garage door transmitter, Genuine wood console insert, Genuine wood dashboard insert, Genuine wood door panel insert, Heated door mirrors, Heated front seats, Heated steering wheel, High intensity discharge headlights: Bi-Xenon, Illuminated entry, Knee airbag, Leather Seats, Leather Shift Knob, Low tire pressure warning, Memory seat, Occupant sensing airbag, Outside temperature display, Overhead airbag, Overhead console, Panic alarm, Passenger door bin, Passenger vanity mirror, Power door mirrors, Power driver seat, Power Liftgate, Power passenger seat, Power steering, Power windows, Radio: AM/FM w/Bluetooth 8.8, Rain sensing wipers, Rear anti-roll bar, Rear audio controls, Rear fog lights, Rear reading lights, Rear seat center armrest, Rear window defroster, Remote keyless entry, Roof rack: rails only, Security system, Speed control, Speed-sensing steering, Speed-Sensitive Wipers, Split folding rear seat, Spoiler, Steering wheel mounted audio controls, Tachometer, Telescoping steering wheel, Tilt steering wheel, Traction control, Trip computer, Turn signal indicator mirrors, Variably intermittent wipers, and Wheels: 19 x 8.0 Y-Spoke Aluminum. 22/28 City/Highway MPGWe offer Market Based Pricing, please call to check on the availability of this vehicle. We'll buy your vehicle even if you don't buy ours. All vehicles are plus TT&L **HOME OF LIFETIME POWERTRAIN WARRANTY ON ALL NEW RAM'S! **EVERY PREOWNED VEHICLE HAS AT LEAST 7/32 OF TIRE TREAD AND AT LEAST 70% BRAKE LIFE REMAINING, OR WE WILL REPLACE IT. **12/12K MI WARRANTY ON ALL USED VEHICLES UNDER 75K MI. 2019 Alfa Romeo Stelvio White Ti AWD 8-Speed Automatic I4THIS VEHICLE INCLUDES THE FOLLOWING FEATURES AND OPTIONS: 3.73 Axle Ratio, 4-Wheel Disc Brakes, 8 Speakers, 8.8 Widescreen Color Display, ABS brakes, Air Conditioning, Alloy wheels, AM/FM radio: SiriusXM, Auto-dimming Rear-View mirror, Automatic temperature control, Brake assist, Bumpers: body-color, Compass, Delay-off headlights, Driver door bin, Driver vanity mirror, Dual front impact airbags, Dual front side impact airbags, Electronic Stability Control, Four wheel independent suspension, Front anti-roll bar, Front Bucket Seats, Front Center Armrest, Front dual zone A/C, Front reading lights, Fully automatic headlights, Garage door transmitter, Genuine wood console insert, Genuine wood dashboard insert, Genuine wood door panel insert, Heated door mirrors, Heated front seats, Heated steering wheel, High intensity discharge headlights: Bi-Xenon, Illuminated entry, Knee airbag, Leather Seats, Leather Shift Knob, Low tire pressure warning, Memory seat, Occupant sensing airbag, Outside temperature display, Overhead airbag, Overhead console, Panic alarm, Passenger door bin, Passenger vanity mirror, Power door mirrors, Power driver seat, Power Liftgate, Power passenger seat, Power steering, Power windows, Radio: AM/FM Bluetooth 8.8, Rain sensing wipers, Rear anti-roll bar, Rear audio controls, Rear fog lights, Rear reading lights, Rear seat center armrest, Rear window defroster, Remote keyless entry, Roof rack: rails only, Security system, Speed control, Speed-sensing steering, Speed-Sensitive Wipers, Split folding rear seat, Spoiler, Steering wheel mounted audio controls, Tachometer, Telescoping steering wheel, Tilt steering wheel, Traction control, Trip computer, Turn signal indicator mirrors, and Variably intermittent wipers. 22/28 City/Highway MPGWe offer Market Based Pricing, please call to check on the availability of this vehicle. We'll buy your vehicle even if you don't buy ours. All vehicles are plus TT&L **HOME OF LIFETIME POWERTRAIN WARRANTY ON ALL NEW RAM'S! **EVERY PREOWNED VEHICLE HAS AT LEAST 7/32 OF TIRE TREAD AND AT LEAST 70% BRAKE LIFE REMAINING, OR WE WILL REPLACE IT. **12/12K MI WARRANTY ON ALL USED VEHICLES UNDER 75K MI. 2019 Alfa Romeo Stelvio Brown Ti AWD 8-Speed Automatic I4THIS VEHICLE INCLUDES THE FOLLOWING FEATURES AND OPTIONS: 3.73 Axle Ratio, 4-Wheel Disc Brakes, 8 Speakers, 8.8 Widescreen Color Display, ABS brakes, Air Conditioning, Alloy wheels, AM/FM radio: SiriusXM, Auto-dimming Rear-View mirror, Automatic temperature control, Brake assist, Bumpers: body-color, Compass, Delay-off headlights, Driver door bin, Driver vanity mirror, Dual front impact airbags, Dual front side impact airbags, Electronic Stability Control, Four wheel independent suspension, Front anti-roll bar, Front Bucket Seats, Front Center Armrest, Front dual zone A/C, Front reading lights, Fully automatic headlights, Garage door transmitter, Genuine wood console insert, Genuine wood dashboard insert, Genuine wood door panel insert, Heated door mirrors, Heated front seats, Heated steering wheel, High intensity discharge headlights: Bi-Xenon, Illuminated entry, Knee airbag, Leather Seats, Leather Shift Knob, Low tire pressure warning, Memory seat, Occupant sensing airbag, Outside temperature display, Overhead airbag, Overhead console, Panic alarm, Passenger door bin, Passenger vanity mirror, Power door mirrors, Power driver seat, Power Liftgate, Power passenger seat, Power steering, Power windows, Radio: AM/FM Bluetooth 8.8, Rain sensing wipers, Rear anti-roll bar, Rear audio controls, Rear fog lights, Rear reading lights, Rear seat center armrest, Rear window defroster, Remote keyless entry, Roof rack: rails only, Security system, Speed control, Speed-sensing steering, Speed-Sensitive Wipers, Split folding rear seat, Spoiler, Steering wheel mounted audio controls, Tachometer, Telescoping steering wheel, Tilt steering wheel, Traction control, Trip computer, Turn signal indicator mirrors, and Variably intermittent wipers. 22/28 City/Highway MPGWe offer Market Based Pricing, please call to check on the availability of this vehicle. We'll buy your vehicle even if you don't buy ours. All vehicles are plus TT&L **HOME OF LIFETIME POWERTRAIN WARRANTY ON ALL NEW RAM'S! **EVERY PREOWNED VEHICLE HAS AT LEAST 7/32 OF TIRE TREAD AND AT LEAST 70% BRAKE LIFE REMAINING, OR WE WILL REPLACE IT. **12/12K MI WARRANTY ON ALL USED VEHICLES UNDER 75K MI. 2018 Alfa Romeo Stelvio Blue Metallic Quadrifoglio AWD 8-Speed Automatic V6THIS VEHICLE INCLUDES THE FOLLOWING FEATURES AND OPTIONS: 15 Speakers, 3.73 Axle Ratio, 4-Wheel Disc Brakes, ABS brakes, Air Conditioning, Alloy wheels, AM/FM radio: SiriusXM, Auto-dimming door mirrors, Auto-dimming Rear-View mirror, Automatic temperature control, Blind spot sensor: Blind Spot Monitoring warning, Brake assist, Bumpers: body-color, Compass, Delay-off headlights, Driver door bin, Driver vanity mirror, Dual front impact airbags, Dual front side impact airbags, Electronic Stability Control, Four wheel independent suspension, Front anti-roll bar, Front Bucket Seats, Front Center Armrest, Front dual zone A/C, Front reading lights, Fully automatic headlights, Garage door transmitter, harman/kardon® Speakers, Heated door mirrors, Heated front seats, Heated steering wheel, High intensity discharge headlights: Bi-Xenon, Illuminated entry, Knee airbag, Leather & Alcantara Seats, Leather Shift Knob, Low tire pressure warning, Memory seat, Navigation System, Occupant sensing airbag, Outside temperature display, Overhead airbag, Overhead console, Panic alarm, Passenger door bin, Passenger vanity mirror, Power door mirrors, Power driver seat, Power Liftgate, Power passenger seat, Power steering, Power windows, Radio: AM/FM/HD Bluetooth w/Nav 8.8, Rain sensing wipers, Rear anti-roll bar, Rear audio controls, Rear fog lights, Rear reading lights, Rear seat center armrest, Rear window defroster, Remote keyless entry, Roof rack: rails only, Security system, Speed control, Speed-sensing steering, Speed-Sensitive Wipers, Split folding rear seat, Spoiler, Steering wheel mounted audio controls, Tachometer, Telescoping steering wheel, Tilt steering wheel, Traction control, Trip computer, Turn signal indicator mirrors, and Variably intermittent wipers.We offer Market Based Pricing, please call to check on the availability of this vehicle. We'll buy your vehicle even if you don't buy ours. All vehicles are plus TT&L **HOME OF LIFETIME POWERTRAIN WARRANTY ON ALL NEW RAM'S! **EVERY PREOWNED VEHICLE HAS AT LEAST 7/32 OF TIRE TREAD AND AT LEAST 70% BRAKE LIFE REMAINING, OR WE WILL REPLACE IT. **12/12K MI WARRANTY ON ALL USED VEHICLES UNDER 75K MI.